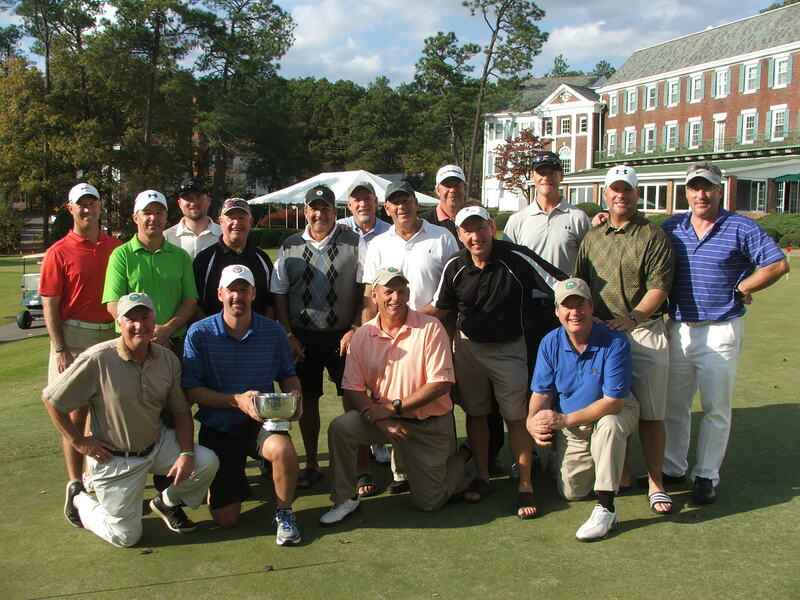 Southern Pines, NC – River Hills CC (Lake Wylie, SC), captured their 3rd CGA Interclub Championship on Sunday (Nov 11) following a 29 to 19 win over the defending champions from Fort Mill GC (Fort Mill, SC). Both teams earned a spot in the championship match with semi-final victories on Saturday. River Hills defeated Mill Creek GC (Mebane, NC) 38-10, while Fort Mill stopped Willow Springs CC (Wilson, NC) in the weekend’s closest match 27–21. In the championship match on Sunday, River Hills jumped out front early as their first 3 pairings captured 14 of 18 match points and built a commanding 14-4 lead. Sandwiched between 4-point wins by their teammates in matches 1 and 3, the River Hills tandem of Doug Cullen and Bud Brown teamed up in match #3 for 6 points as they won both individual matches at 1-up over Tom Rush and Ernie Keener and took the four-ball match 2&1. Fort Mill momentarily turned the momentum in match #4 when Captain Terry Lynn and teammate Dave Sturick won 4 of 6 points over Jim Sears and Harold Fisher, cutting the deficit to 16 to 8. River Hills countered with another 6 point win as Travis Palmer and Tom Bookmiller won 4&3 and 3&2 over Bob Pitzer and Ray Racer respectively, and took the four-ball match 4&3. Needing only 3 points to seal the deal, Dean White and Paul Bechtold guaranteed the championship for River Hills in the following match winning 4 points over Mike Jones and Tom Smith. All three matches in this group were decided by 1-up wins and, if all three had gone in favor of Fort Mill, it could have turned the tide for repeat performance for Fort Mill. In the final two matches, Fort Mill’s Mike Trull and Rick Fricke cut the deficit to 10 points as they led their team with 6 points in match #7. Match #8 was split 3 and 3 between River Hills Jamie Lightsey (3&2) and Mike Granger against Fort Mill’s Matt Boepple and Eric McHone (3&2). River Hills won this championship in 2009 and 2002 and was runner-up in 2006. On Saturday, the first semi-final match saw River Hills dominate the team from Mill Creek by winning 13 of 16 individual matches, halving one, and taking 11 of 16 points in the four-ball matches. River Hills long time Captain Gary Schneider, who is retiring from the position and will be moving to Southern California in January, teamed up with Martin Salas in match #1 to start their run by winning all 6 points. The River Hills teams of Sears/Fisher, White/Bechtold and Garrett/Thomas went undefeated (6-0) to pad the River Hills lead. Mill Creek’s Dale Austin and Jim Boteler won 4 match points while teammates Paul Sanborn and Justin Fowler halved their match against Travis Palmer and Tom Bookmiller to lead their teams scoring. This was Mill Creek’s first appearance in the final-four after winning the 2012 North Region, and Captain Jake Yount and his team expressed appreciation to the CGA for the experience and vowed to work hard for a return in 2013. In the other semi-final, Willow Springs was hoping for their second return to the finals so they could avenge their 30-18 loss in the 2007 Championship match. Trailing Fort Mill 9-3 with two matches complete, the teams of Scott Hill/Jerry Barnes and Randy Garris/Danny Brite brought Willow Springs back into a tie following 5 to 1 and 4 to 2 wins respectively. Harry Helmer and Bo Corn gave Willow Springs their first lead with a 4 to 2 win in match #6. Fort Mill pulled even when Mike Trull and Rick Fricke won 4 points in match #7. An invitation to the finals for either team rested on match #8 between Fort Mill’s Jamie Lightsey with Mike Granger and Willow Spring’s Will Pope playing with Troy Haynes. After 9 holes, Willow Springs was 1 down in their four-ball match, down 2 in one individual match and all square in the other. Lightsey then eagled their 10th hole (a par 4) while Granger birdied the 13th to close out the four-ball match (6&4). Their steady play on the back nine continued and ended the individual matches on the 15th and 17th holes earning Fort Mill 6 points and a spot in the championship match. 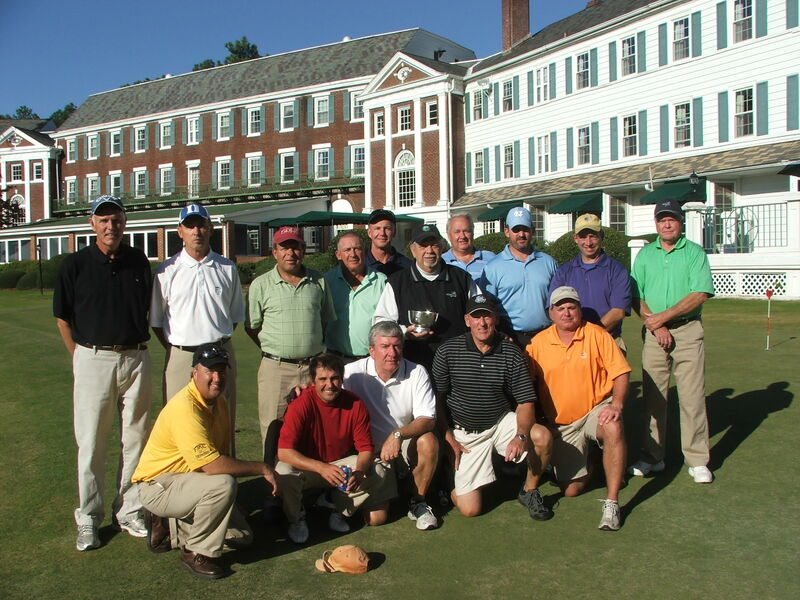 This CGA Championship is the culmination of a single elimination playoff process following regular season qualifying. 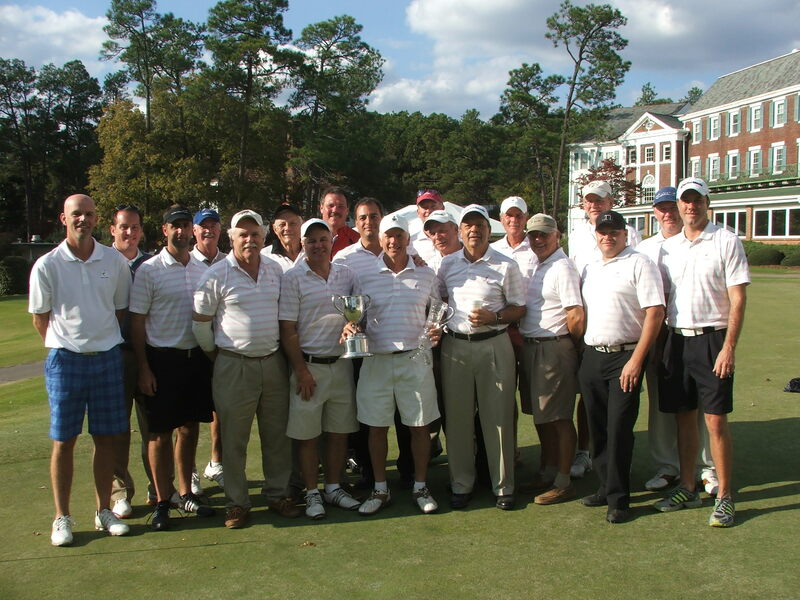 This year’s playoffs involved a record 38 teams with the final four clubs earning their way to compete in the semi-finals and championship match at Mid Pines Inn and Golf Club in Southern Pines. 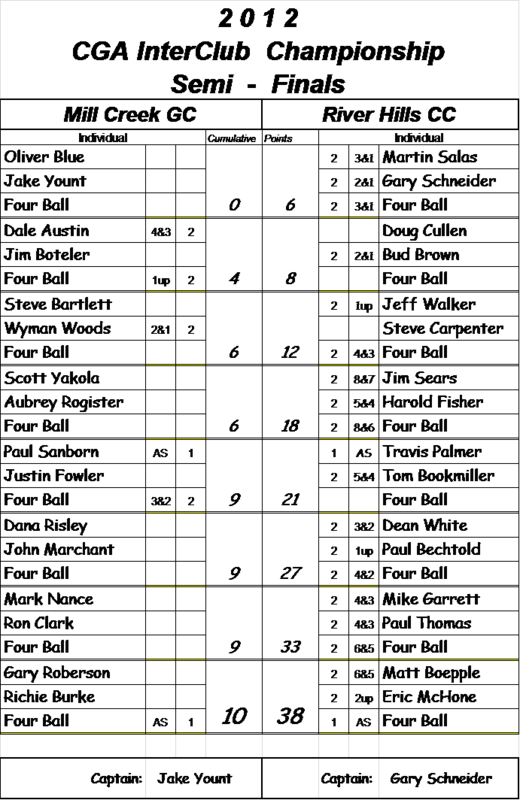 The final-four format involved 16 players from each club competing in both singles and four-ball match play simultaneously. Each match is worth 2 points with a total of 48 points up for grabs. 25 points are needed to win the championship. Interclub competition begins with team applications in March, with regular season play from May through August. 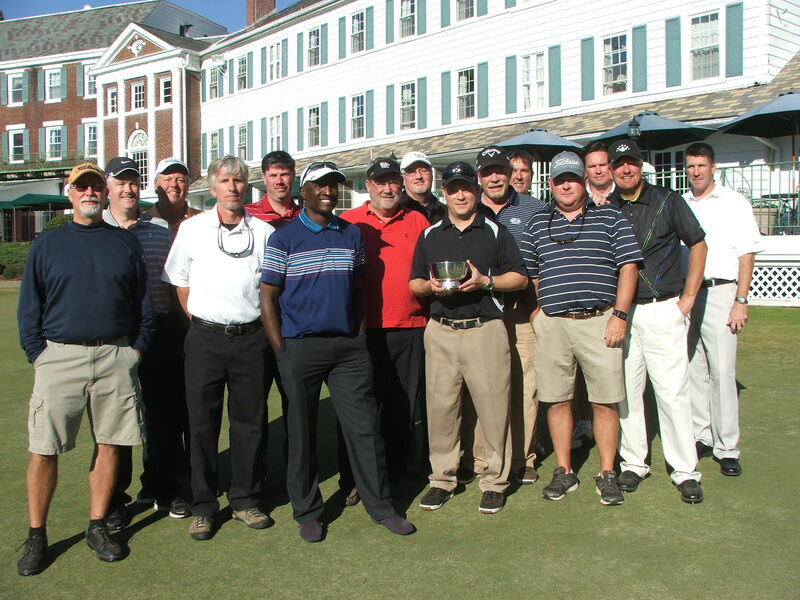 For more information please visit the CGA Interclub website, email CGA or call 910-673-1000.